Are you longing for a fresh new walk with the Lord? Do you sense a need for a more intimate relationship with your Father God? 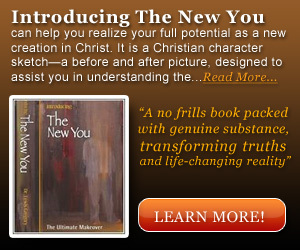 If so, then THE NEW YOU, along with THE COMPANION GUIDE is just for you. This Companion Guide is designed to help you get the most out of your study of the book The New You. It will cause you to focus on the main points, as well as consider the personal ramifications for your own life. The main objective of this book and study guide is to assist you in getting to know God. This is an excellent discipleship tool for churches, home groups, schools or individuals. The New You, in conjunction with The New You Companion Guide, are ideal for individuals or groups. Whichever way you choose, proceed prayerfully and expectantly. God has a lot in store for you! A careful, prayerful study of THE NEW YOU using the accompanying Companion Guide can, by the grace of God facilitate a true change—a transformed life from the inside out! Now that’s the ultimate makeover!